﻿ HuntingNut » Forums » Firearms, Shooting & Reloading » Reloading Ammunition » 8X60S Anyone? Posted: Sun Jun 03, 2012 4:58 am Post subject: 8X60S Anyone? I didn't have enough 8mm's. I only have 8X56M.S., 8X57S, 8X68S, and a .320 Howell so I picked up an old "98 sporter in said caliber. A friend of mine has a really nice BRNO worked over by G&H he just got. I volunteered to do the load development. As far as I can tell a MAX load for 8X57S seems to be a starting load for 8X60S. There isn't alot of data laying around anybody else doing this? Posted: Sun Jun 03, 2012 5:55 am Post subject: Re: 8X60S Anyone? but when you can already handle the 8x68S... are you also familiar with his sister the 6,5x68? I don't own a 8x60S myself, but I'll ask around. We had some funny rules in the past about special licenses for calibers that were used by armys in the world, but we had very clever gunsmiths in Luik/Liège who shortened or lengthened some cartridges, so the 8x60S is rather common here. Posted: Sun Jun 03, 2012 6:17 am Post subject: Re: 8X60S Anyone? Here is a scan from my 1997 book COTW. Posted: Sun Jun 03, 2012 4:01 pm Post subject: Re: 8X60S Anyone? Thanks Guys, Yeah Aloy I know, I have always liked that bore size for some reason. Maybe someday I'll find a cute little "K" in 8X51. I have a Reamer for 8X68S Ackley but haven't found a candidate for that yet. It's a funny bolt face size we don't encounter alot . The .320 I have is just a little more volume then the Brenneke. And I know there are more. 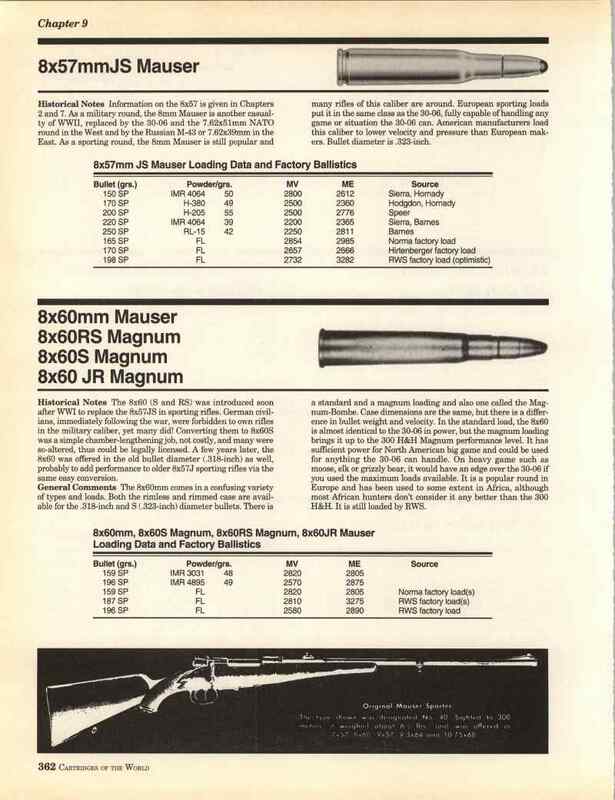 The 6.5x68 is pretty much an R.W.S. cartridge if I remember right. 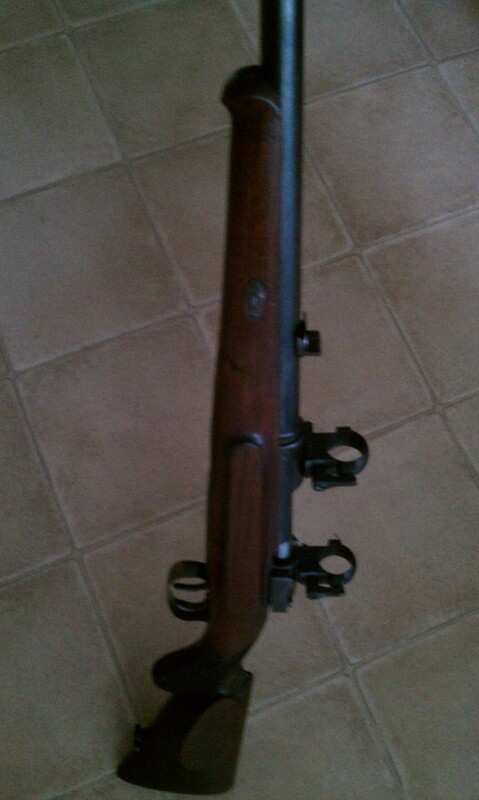 very similiar to a .264 Winchester. 6.5m.m. is another playground for the mind entirely. And I like them. That would be great. Getting a load from there would be like water straight from the mountains. I have alot of Viht540. Hey omni the rifle in that picture is almost identical to mine except mine has a rounded grip and a little more pronounced schnabel. Also mine is a small ring. Posted: Sat Jun 09, 2012 8:10 pm Post subject: Re: 8X60S Anyone? maybe this is Aussie stuff I found loads of 47g-52g of SP7 and 46g-51g of TU3000 for 180g bullets, and 45g-50g for TU5000. I don't know what any of these powders are, but it seems like some other thread has referred to them? Help Please. Posted: Sat Jun 09, 2012 8:28 pm Post subject: Re: 8X60S Anyone? Posted: Sun Jun 10, 2012 6:59 am Post subject: Re: 8X60S Anyone? Don't know who makes it FN...but I do know it isn't made by ADI Thales out he in Aussieland. Posted: Sun Jun 10, 2012 9:03 am Post subject: Re: 8X60S Anyone? If you need more info, here are the distributors of Noble Sport (Italy) Vectan powder and ammo. Pin Oak Hill Game Management Area Inc.
Powder Horn Guns & Sporting Goods Inc.
Posted: Sun Jun 10, 2012 10:15 am Post subject: Re: 8X60S Anyone? Posted: Mon Jun 11, 2012 1:51 pm Post subject: Re: 8X60S Anyone? Altough PCl-powders are no longer available, you'll see some data using PCl511 (and magnum primers). When you know that PCl511 is rather close on the burning rate with Winchester 760, then you should be able to have a good start. in this table you also have the Vectan-powders listed. Hope it can help you as I still didn't have time to ask around. Posted: Wed Oct 17, 2012 1:11 pm Post subject: Re: 8X60S Anyone? and I hope German is easier to read and understand than Chinese or Russian, if not: names of powder and numbers to indicate the weight are easy, for the rest use a translator if necessary. Posted: Wed Oct 17, 2012 6:57 pm Post subject: Re: 8X60S Anyone? You are correct, that is the best one I have seen yet. Posted: Thu Oct 18, 2012 1:17 am Post subject: Re: 8X60S Anyone? Maybe I get also some data from Rotweil. Posted: Tue Sep 26, 2017 7:20 pm Post subject: Re: 8X60S Anyone? Worked up to a 50g charge of Vight N540 under a .323" 180g Nosler Ballistic Tip in a P.P.U. 8x60s case primed w Winchester W.L.R. primers to a C.O.A.L. of 80.88mm's. I'm fairly confident this will prove to be close to max. Does anyone have software that can predict this to be true? This appealed to me because I recently came into possession of 4 pounds of this powder and 200 of these projectiles. I'm cautiously posting this as I believe I'm the only one online using this combo. I'm watching for signs of pressure (primers, case expansion,) but I don't have enough reloadings on the case to use primer pockets. I wouldn't try this unless I was confident it was safe but, I've missed things before so am polling for anyone to put a 2nd or 3rd set of eyes on it. Posted: Wed Sep 27, 2017 1:09 am Post subject: Re: 8X60S Anyone? OAL: 81,0 mm - 3,189"